We all deal with problems. They creep up constantly - not just in business, but in our personal lives too. That doesn’t mean it’s a bad thing, but if we can get really good at solving those problems, we’ll be way further ahead. Our success really depends on our ability to effectively solve the problems that are coming up. That’s why I want to share my framework for solving problems. It’s super simple and easy to use! To show you what I mean, I’ll use the example of my kitchen table so that you can see how it relates to a real problem. Even though it’s a small problem, the same applies to bigger problems as well. So, the problem with the kitchen table was that when we first moved into our house, we had a really big, nice table that we loved. Unfortunately, it wasn’t really the right table for our new space – it was too big. I’ll share this framework for solving problems, and you’ll see how it related to this problem we were having with our table. I call this the Q&A framework, but instead of Questions and Answers, it’s QUESTIONS and ACTIONS. There are 3 questions and 3 actions – that’s it! First ask yourself what the problem actually is. It’s really easy to skip this because we usually think we know what the problem is, but if we take the time to really think about it and define what’s going on under the surface, sometimes we’re surprised to find out that it’s not exactly what we thought it was. Here’s how this related to my table problem. We thought the problem was: the kitchen table is too big. So, we decided to solve that problem by getting rid of that really nice, big, beautiful table and getting a new one. It was a lot smaller and it was round instead of a rectangle, so it fit the space much better. What happened was that there wasn’t enough room at the new table for everyone in the family. The table would be fine for a family of four, but there are six of us. The new table extended to a bigger size, but when we extended the table, it became too big for the space again. We still had a problem, so what did we do? We built a table! We thought: Our space is just kind of a weird shape, it’s too small, there are six of us, there’s not enough space, we need a custom table! So, we built a table! We had never done that before, but we learned how to do it. It turned out to be beautiful! It was a really nice rustic farmhouse-style table with a dark stain – it was great! We put it in the space and it looked perfect. Amazing! Problem solved! A year later, we were struggling with the fact that the kids were always in a really bad mood when it was time to eat, so we were working on trying to solve that problem. Well it turns out that they were in a bad mood because this really nice custom table that we built - although it looked perfect and fit the space really well - they felt really cramped when they were eating! And the more they grew, the more cramped they felt. They didn’t like it but they never told us. They would just be in a bad mood, so we always had friction at suppertime with the family. So, it turns out that the problem wasn’t with the table, the problem was just that the space is too small for a family of six. We were trying to solve the wrong problem. That’s why defining the problem is so incredibly important. Sometimes it’s just a little tweak on what you think it is. We thought our table was the problem, but it was the space that was the problem. Still very closely related but not exactly the same thing, so the solutions are going to be very different. Here’s the next question – Why? Why is this happening? Why do you have a problem? What is the root cause of what’s going on? We didn’t really do this right with the table problem. If we had dug deeper into finding the root cause of the problem, we would have realized that it wasn’t the actual table, it was just that the space was small for our family. It’s a lot easier to determine the root cause and why you’re having a problem when you’ve clearly defined what the problem is to begin with. Even though those are two really simple questions – What and Why – it’s so important to take the time to really think about it and define it before you jump into finding solutions. How are you going to solve the problem? My favorite way to do this is to just brainstorm ideas. Once you’ve defined what the problem is and why it’s happening, brainstorm every solution you can think of that would help to solve the problem. Okay so now let’s move into our As – Action! Now that you’ve got your brainstorm list of all the possible solutions to your problem, it’s time to decide which one you’re going to do. If you’ve clearly defined what you’re trying to solve, this becomes much easier. For us, with the table, we made the wrong decision. We decided we were going to change the table, change the shape, even learn how to build a table! We spent all that time, energy, and money on the table problem when we were deciding on the solution based on the wrong problem. So, once you have all your groundwork covered with the right questions and the right answers, your first action is to just decide. And don’t be scared to make the wrong decision, because any decision is better than indecision. So just decide which one you’re going to do. Pretty simple, right? You’ve decided what the solution is that you’re going to try, so then actually do it. It seems painfully obvious but it needs to be said because a lot of the time, we think through solutions and then we decide what we’re going to do, and then we stop! I don’t know why we do this but it happens all the time, I’ve seen it time and time again. So, once you have your solution and you’ve decided - actually do it! If you’re not the one who’s going to do it, figure out who is, and make a plan for actually making it happen. And make it happen as soon as you can because the quicker you take action on your problem, the quicker it’s going to go away. By check, I mean track, measure, check your solution. Check the action that you took to see if it’s working, to see if it’s solving the problem. Again, with the table, we were sort of checking but we could have done a better job at it because we traded one problem for another problem! We built a great table for our space, but it was too small for our family so we created the problem of the kids being really cranky when it was time for a meal. That’s why it’s so important to check to see if what you’re doing is actually solving the problem – or maybe it’s creating a new one like it did for us! If your solution isn’t working, then you’ve got your brainstorm list so you can pick another one and try again. The only way you’re going to solve those problems is if you get the drama out of the way, find out what’s really happening under the surface, take action to solve the problem, and then see if it’s working. That’s it! That’s all we can do, that’s what we can control. Just so you know what we did with the table, we decided to go with the middle one, because even though it is a little big for our space, at least everybody is happy and to us that was more important than the perfect looking table. So - everyone is happy now, that’s the update on that situation! That was a valuable lesson learned for us, and I think this framework really helps. So, just remember: Q&A – QUESTIONS and ACTIONS. 3. How can you solve it? 1. Decide what you’re going to do about it. 3. Check To see if it’s working. That’s it! I hope this was helpful, and I’d love to know if you have any favorite ways to solve problems so that we can all help each other. 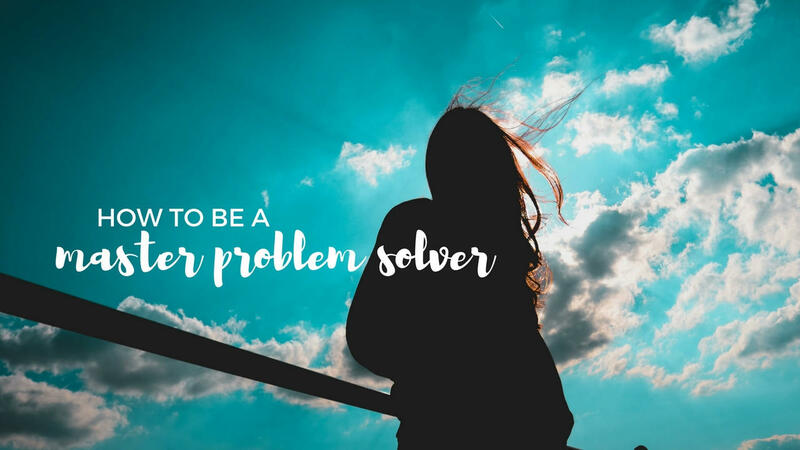 If you like this post, please share it with your friends, because if we can help each other solve problems, imagine how awesome that would be! Get this FREE video that will teach you my 5 Best Ways To Beat Mom Burnout so you can instantly bring more balance and happiness into your life. A must-watch! Watch this FREE 10 minute video: "My 5 Best Ways To Beat Mom Burnout", and learn how to bring immediate peace into your day! You'll get new posts delivered right to your inbox and will be the first to know about new offers, giveaways, and other cool subscriber-only perks!